Giovanni Antonio Paracca, called Il Vasoldo. Italian sculptor. He was active in Genoa from 1555 till 1560, where he executed the statue of Dario Vivaldi in Palazzo di San Giorgio. 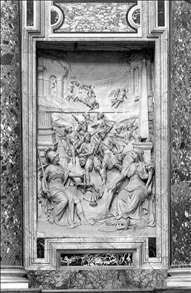 In 1562 he realized the statues for Bagno delle Nimfe in Palazzo delle Peschiere, after a design of Galeazzo Alessi. He had been in Rome since his youth and, like so many others, had busied himself in the profitable business of "restoration" of ancient sculpture. In 1591 he was commissioned to complete the tomb of Sixtus V in the Sistine Chapel of the Santa Maria Maggiore in Rome. 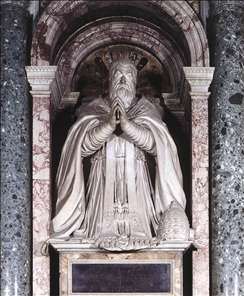 In the same year he became responsible for the statues of Sts Peter and Paul for the Cesi Chapel in the Chiesa Nuova (Santa Maria in Valicella) coming into contact with St Philip Neri s Congregation of the Oratory. See more details about "Statue of Sixtus V"
See more details about "Sixtus V's Temporal Goverment with Justice and Peace"